Masquerade party is all about the dress-up. It’s just not as fun without the costume. It would be ideal that all your guests wear one, but don’t be too hard on them if they don’t. This page will help you plan your event with all the party specifics, including invitations, decorations, food and so on. Purchase paper masks. (To find inexpensive ones, take a look at the supplies link above.) Write your party information on parchment paper, roll the invitations into scrolls and attach them to the masks. Since costume party requires a lot of preparation for your guests, send or hand deliver your invites about 2 months prior to the event. 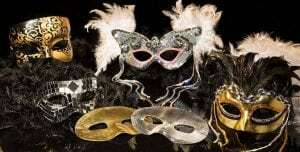 Purple, blue, green, gold are ideal colors for masquerade party decorations. Adorn your party area with helium balloons and paper streamers in those colors. Play the Phantom of the Opera soundtrack. Rent a disco ball and fog machine, and put them to use to create a festive atmosphere. Scatter glitter beads and masquerade mime cutouts (available from party stores) around the room. Draw and color fleur-de-lis shapes on construction paper, and hang them on the walls. Hang masks decorated with blue and purple feathers. Cover your party table with a purple tablecloth. Place a vase with a tea light candle for a centerpiece. Add some more balloons and streamers to the scene. Provide such party favors as beads, masks, crowns, tiaras, lace gloves, bracelets, and so on. *Guess How Many: Place gold chocolate coins in a clear jar. Have each party attendee to guess the number of coins in the jar. The person who guesses the closest to the actual amount, gets to take a jar full of chocolate home. *Picture Taking: Take individual and group pictures of your guests wearing their costumes and masks. *Celebrity Trivia: Have a trivia game where you test guests’ knowledge of famous people: actors, singers, athletes, TV personalities, etc. *Dance, Dance: Play some upbeat music and invite your guests to dance. Tip: if you feel that your guests are not very open to the games, then have them dance for the whole party. *Masquerade Cake: Bake a rectangular cake. Let it cool, and ice it in a color of your choice. Write a party message on it, and then place a masquerade mask with feathers on top of the cake. Serve your party drinks in champagne flutes or wine glasses.